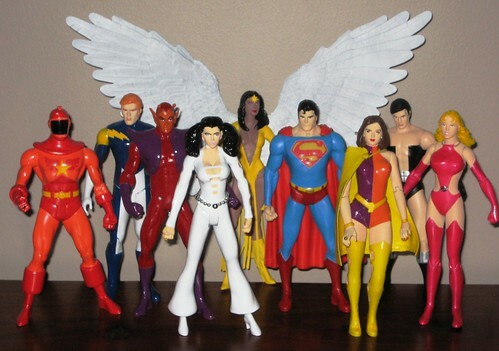 Lastest and Greatest Bronze Age Legion Customs! Quite some time ago now, the rather amazing customiser and my good friend Dr Terrific and I started on a journey to create a complete line of Bronze Age Legion of Superheroes Customs. It began as a gift of a Wildfire custom, then a Dawnstar to go with Wildfire, and then somehow turned into a quest to complete the whole gang. Alongside Wildfire and Dawnstar, I received the first "wave" of the three Legion founders at the end of last year, and from now on Dr T will be completing the heroes in waves of four in the order of joining. That means that the next "wave" is Duo Damsel (formerly Triplicate Girl), Phantom Girl, Superboy and Chameleon Boy. The gang arrived a week ago and to say I'm rapt is a major understatement. I'm WAY rapt! If there was one figure in the whole Bronze Age Legion project that had to work to make the whole thing work, it's Phantom Girl. For some reason I really can't explain, Phantom Girl has always been my favourite member of my favourite super team, and her iconic white bell bottoms and pigtails look very much sums up the Bronze Age Legion style. I was very confident in Dr T to deliver, especially since he knew how important she was to me, but I am totally blown away by the result. 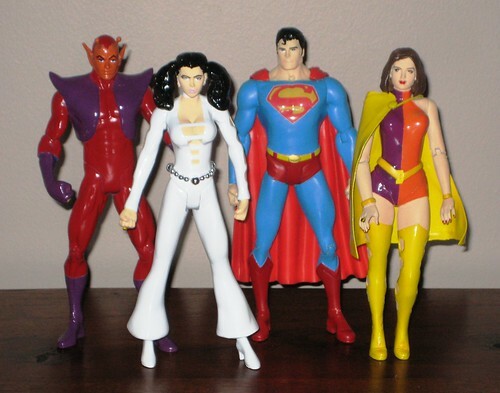 The base is a JLA Vixen with swapped hands, and there's major sculpting work in those bell bottoms! All white could look horrible in the hands of the wrong painter, but not so here - the shiny spraypaint-work of Dr T comes through here in a big way. I am in absolute love with this figure. Superboy might look like a simple JLA Superman repaint, but looks can be deceptive! Dr T went to great lengths through sculpting, sanding and paint to cut down the size and muscle definition of the base figure to make sure this looks like the teenage Clark and not the beefed up adult version. The "S" symbol is also redone, and the hairstyle modified to reflect Superboy's 70's "do". A great piece! Duo Damsel had an interesting look in the Bronze Age, and Dr T worked very hard with us to find source pics and nail the colours and the hair to transform a Watchmen Silk Spectre I into this futuristic beauty. Chameleon Boy started his life as a JLA Black Lightning, but turned out 100% Durlan. The colours are spot-on, and the sculpted vest, ears and antennae make this custom work fantastically. So once again, I am in great debt to Dr Terrific and his amazing skills. While I'm obviously helping out with costs and Dr T's time, I know this is also a labour of love for him and I am incredibly grateful. The next "wave" Colossal Boy, Star Boy, Brainiac 5 and Invisible Kid is already taking shape and progress shots can be seen on the AFB Forum. Can't wait! You can see more pics at Facebook, discuss this at the AFB Forum (the discussion thread is here, the whole BA Legion Customs in progress thread is here) and comment on this post to enter the April AFB Comment of the Month Contest. Those look so frackin' awesome we should be pushing for Dr T to get a job working for DCD or MAttel (not Crapsbro, we want him to have a nice job). I've said it before, but I'll say it again: Dr Terrific is one of the best, ever! Scott if this is a "quest" then I want to see more of these... good job by the way and props for the effort. Great looking customs. Love the group shot. have I mentioned how much I love the winged one? I love the winged one. Amazon Leaks DCUC Wave 15?